I love attending weddings. In fact, I’ve lucked out this Christmas with the lovely pleasure of ending the year with a wedding in a secret location in beautiful New Zealand. If you’ve ever planned a wedding, you’ll understand the costs involved and how they are all add up. Read on to discover the staggering average spend on an Aussie wedding (scary), how to get your beautiful flowers wholesale and other random money-saving wedding tips. Mmmm, that sure looks like a home deposit to me. So let’s see how I can help you save big on your wedding, so you can then afford to live in a home after the fact. Note: Be sure to scroll the end of this article for an awesome infographic, which breaks down the above figure perfectly. Did you know you can purchase market-fresh flowers online at wholesale prices? Sites like Tesselaar Flowers are wholesale and wedding flower experts. They offer a service where you can buy wholesale flowers by the bucket, order online (also in-person or by phone) and they deliver nationwide. They also make the process easy with a 5-step process including a centrepiece style, flower package, color theme, number of bundles and then delivery. Skip big cheese platters and go for veggies, dips and creatively displayed cheaper items. Try setting up ‘stations’ with different types of food. (E.g Wok with noodles and veg) – present in cute boxes guests can stand around with. Fake your cake. Just make the top or bottom tier of your cake real. 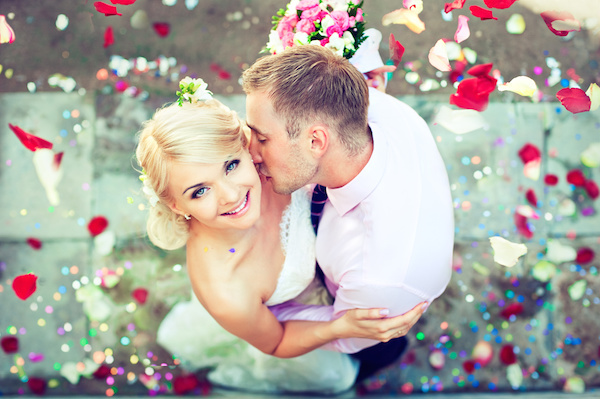 If you know anyone in a band or a great acoustic singer – be sure to ask them to come sing at your wedding! There are many ‘budding photographers’ out there now (you just have to think of Instagram) who own iPhones. Ask your guests to take pictures and put them up online after the event – some of your best pictures will come from your guests (You could hand out a little card requesting this at the beginning of the event). Hire cheaper photographers on places like Airtasker – just make sure you see their portfolio and work first! Put together your own wedding album or create a stunning photo book online – that actually looks like a real book! Create your own cool photo booth at your event. You can even have a box of ‘dress up’ clothes (e.g hats, boas) handy for your guests to have fun with. Anything with the word ‘wedding’ attached to it will cost you more. Consider purchasing a stylish formal dress in white or a stunning cocktail dress for a fraction of the cost of the wedding dress. Give guests ‘things to do’ like a giant Kenga game or even ping-pong! Have a reception at a restaurant as you won’t have to worry about setting up the room, lighting, catering, waiters or pretty much anything! Infographic | How much can a wedding cost?